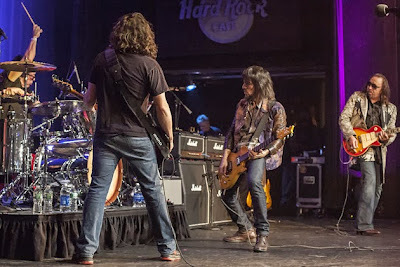 www.ultimateclassicrock.com | Photo: Antonio Marino Jr. Ace Frehley and Peter Criss played together onstage together for the first time in 13 years last night. The former Kiss bandmates were at the Hard Rock Cafe in New York City to celebrate the 30th anniversary for radio and TV host Eddie Trunk’s radio show. According to Blabbermouth, Frehley and Criss were part of an all-star jam band that was on hand to help Trunk, who also co-hosts VH1 Classic’s ‘That Metal Show,’ celebrate 30 years of his rock ‘n’ roll radio show. Dream Theater drummer Mike Portnoy was the evening’s musical director. He led the band — which included members of Guns N’ Roses, Twisted Sister and Anthrax – through covers of songs by Deep Purple, Van Halen and UFO.